When it comes to family recipes, this one is a shoe in. When I was growing up, we would have Sunday dinners at my Grandparents house often. When I was really little, it was once a month. As the family grew, it faded into a once a month thing, and I always looked forward to that meal. It was a time to get together with all my cousins and laugh and play and make memories. We’d pick raspberries, play baseball, and play in the basement. I remember when I was little, my grandma has a Super Nintendo. It was awesome. The only game I remember her having is Paper Boy. It was great. She also had a game called Crackers in the Bed. I don’t really remember what that one was all about, but I do remember playing, a lot. And the best part, homemade ice cream. Almost every time we got together, my Grandpa made homemade ice cream. The family dinners still happen, but I now live too far away to attend. I miss those days, but it’s amazing how much food can bring back a memory. I picked out one of my favorite recipes that my grandpa used to make and whipped some up. Just one bite made me remember the days when I was eating the ice cream on the back porch with my cousins. What great memories. I realize that my readers (besides the family) won’t have the memories attached to this recipe that I do, but you should make it anyway. It’s way better than any ice cream you will ever buy in a store. You do need an ice cream maker to make this recipe. 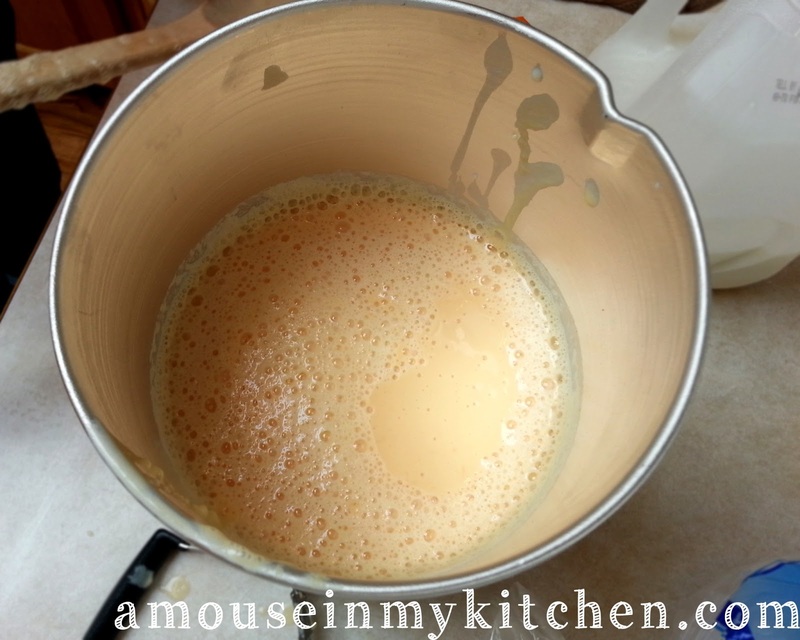 The one I used was a 6 quart machine, so be sure to modify the recipe if your machine is smaller. Mash up the bananas in a bowl. A pastry cutter works well for this. 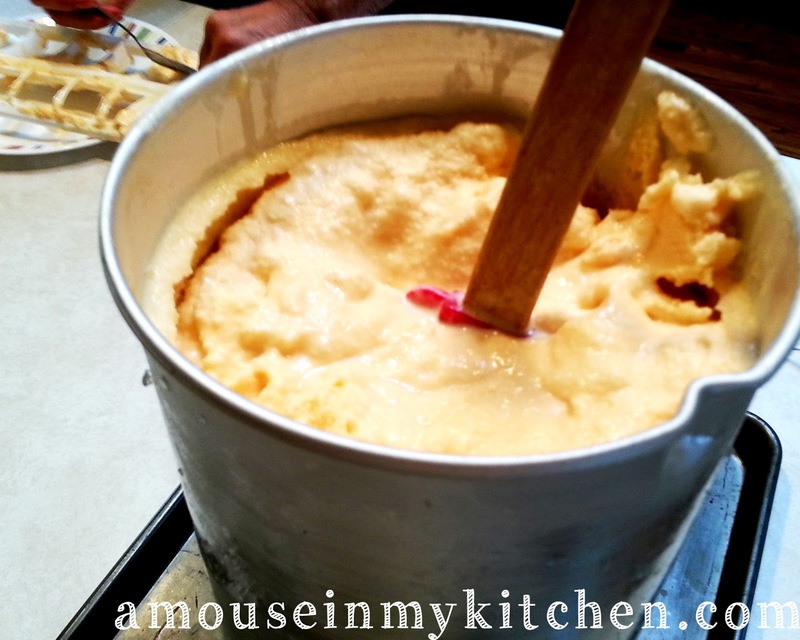 Pour the crushed pineapple (don’t drain) into the ice cream maker. Dump in the mashed bananas. Stir. Pour in the 1/2 and 1/2. Stir. Dump in the sugar. Stir. Dump in the orange kool-aid. Stir. Fill the machine to the fill line (about 2/3 of the way full) with milk. Freeze according to your machines directions. Enjoy! I know I did. 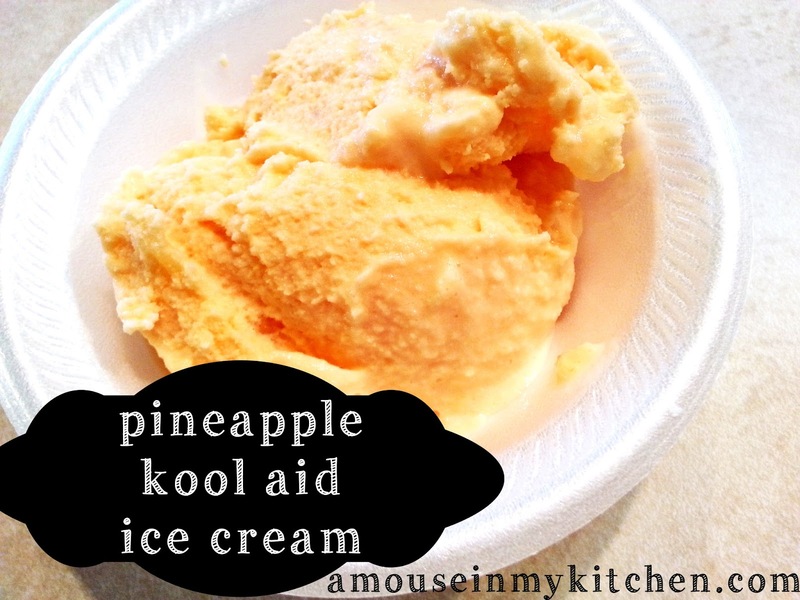 Delicious Pineapple Kool-aid flavored ice cream made in an ice cream maker. Easy and a huge hit. Freeze according to your machines directions. 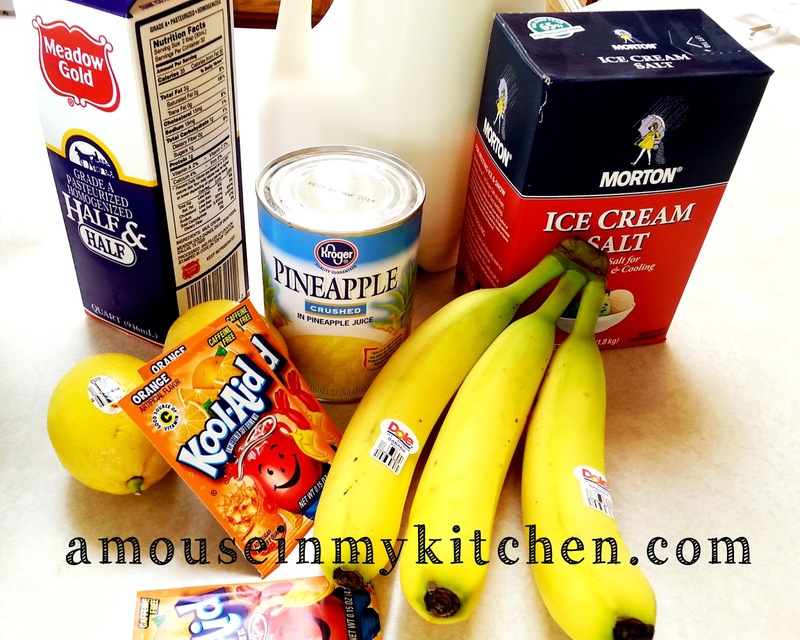 For other dessert recipes, click here!